Shine on you crazy diamond!! Taimane has often been described as a musical child prodigy. Interestingly, she developed her extraordinary skills by performing on the streets of Waikiki to help raise money for the poor. She began this at the young age of 11 ....and she continues to do so to this day, now 19 years old. Taimane polished her skills while performing with the legendary Don Ho starting at 14 years of age. Mr. Ho was the ultimate professional entertainer for over 45 years! He kindly and with "aloha" took Taimane under his wing and gently helped her until she glowed with self confidence and learned what real entertaining is all about, "aloha." He was a wonderful mentor and will be loved forever. 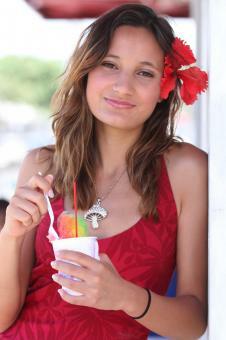 Taimane has performed in Las Vegas, Palm Springs and numerous locations with the Don Ho Show. Thank you, "Uncle Don". Many people have described Taimane as the "Female Carlos Santana". One member of an audience said simply, "She is nimble, fast, and precise, she's unbelievable, her singing balances her ukulele beautifully." A local writer described her style of playing as "a controlled frenzy" on her fast songs, "gentle artistry" on her slow songs. Taimane calls it "playing with aloha". Whatever it is .......her technique is awesome and she has created her own special, unique style. One of her songs entitled LED ZEPPLIN MEETS BEETHOVEN..... displays an uncanny ability to blend classic contemporary songs with classical music. Perhaps her best quality is her on-stage presence. She commands the attention of the crowd as she gracefully and with tremendous energy moves to every corner of the stage. Her charisma creates a bond with everyone who sees her perform. As one fan stated, "you can tell that Taimane loves what she's doing, you can see it in her face."